Denzel Washington teams up with his Training Day director, Antoine Fuqua, in this fun action thriller. What’s it About? Based on the 80s television show of the same name, Washington stars as Robert McCall, a man with a mysterious past, but one he’s seemingly left behind. He is a man who follows a strict routine, part of which involves going to a diner in the middle of the night, where he befriends a young prostitute, Teri (Chloe Grace Moretz). It’s Teri who brings his past out of him, and who breaks him out of his quiet life. When she ends up in a hospital he can’t help but get involved to ‘equalize’ the odds, which leads to him taking on a Russian mob single-handedly. The Verdict: We spend about the first twenty minutes with Robert just observing his routine, his sociable work life (he works in a hardware store) and his solitary personal life. He’s very much an obsessive compulsive, which manifests itself with the lining up of cutlery on the table, opening and closing of doors, and in his strict routine itself. This sets him apart from other action heroes. The term action hero isn’t something that is applied usually to an almost 60-year old, especially without bringing up thoughts of Red, The Expendables (this film and the second Expendables share the same writer, Richard Wenk),or other films in the ‘geri-action’ genre, but Denzel feels a class above those. He doesn’t need self-parody as he’s still on top of his game, and this film only reinforces that. He’s a safe pair of hands and has been doing similar roles for years now. Put simply, this is basically a superhero film. Though we don’t see his origin story as such, we see him acting as a vigilante, with fighting skills that would be a match for many of the characters in a Marvel movie. With the action comes a lot of violence. It isn’t watered down as many movies are, instead embracing its extreme bloodiness, though it’s largely comic book style violence to match his superhero persona, like something straight out of Sin City – bottles in the eye, corkscrews through the neck and stabbing galore. This could put off some squeamish viewers, but it’s in stark contrast to the fairly slow pacing of the non-action moments. Moretz is sweet, but seems miscast as a Russian prostitute; Melissa Leo and Bill Pullman pop up, but aren’t in it for very long, so the film is very much reliant on the screen presence of Washington, and some great action sequences. It’s up to Robert, and Robert alone, to take down the Russian mob (led by Marton Csokas’ Teddy), but the Russian gangster enemies are unoriginal and never really pose much threat. A real sense of threat or jeopardy are lacking in the film overall, and it would probably have more emotional resonance if at any point it felt like Robert had taken on too much and might actually lose. Throughout the film we see Robert timing himself and looking at his watch, and some audience members will probably find themselves doing the same. At over two hours, it should have been a little tighter, as it sags slightly in the middle, but it pulls itself together for the climax. The climax of the movie takes place in the hardware store in which Robert works, in a brilliant and well thought-out action premise. It provides an excellent setting for a range of comical but brutal Home Alone-style traps and some very creative deaths, in a scene that will make you forgive some of the earlier criticisms. Overall, the film is fun and doesn’t take itself too seriously. It does embrace some action movie clichés, which it probably could have done without. Denzel does what will probably become the definitive ‘walking away from an explosion without looking’, which can’t help but bring a smile. 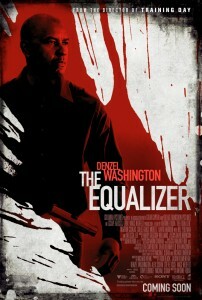 The Equalizer is very silly at times, but it pulls it off. There are a couple of interesting visual touches to the film, notably the slow-motion scenes as some action is about to take place, in which Robert thinks through how he’s going to go about dispatching multiple bad guys. This has been done before, but works well at showing how Robert’s mind works, and provides great calm-before-the-storm moments. The Equalizer sets itself up for a potential sequel at the end, and it’s probably done enough in this film to convince most people it deserves one. Final Words: If Denzel Washington dispatching multiple villains in exciting action scenes sounds like fun, then you will love this movie. It’s a fun action film that feels original enough despite unoriginal villains and its leaning towards clichés. The Equalizer is in UK cinemas on 26th September 2014.